Ulcinj (Montenegrin Cyrillic: Улцињ, [ǔlt͡siɲ]; Albanian: Ulqini) is a town on the southern coast of Montenegro and the capital of Ulcinj Municipality. It has an urban population of 10,707 (2011), the majority being Albanians. As one of the oldest settlements in the Adriatic coast, it was founded in 5th century BC. It was captured by the Romans in 163 BC from the Illyrians. With the division of the Roman Empire, it became part of the Byzantine Empire. During the Middle Ages it was under South Slavic rule for a few centuries. In 1405 it became part of Republic of Venice and in 1571 part of Ottoman Empire. Ulcinj was ceded to the Principality of Montenegro in 1878. It is a former medieval Catholic bishopric and remains a Latin titular see. Ulcinj is a famous destination for tourists, because of its Long Beach, Lake Šas, Ada Bojana Island and for its two-millennia-old Ulcinj Castle. Ulcinj is also the centre of the Albanian community in Montenegro. Early historian Livy (59 BC–AD 17) mentioned it, as did Pliny the Elder (23–79), who mentioned it as Olcinium, its old name Colchinium, "founded by [settlers from] Colchis" (Olchinium quod antea Colchinium dictum est a Colchis conditum). Ptolemy (90–168) mentions the city as Greek Oulkinion (Ουλκίνιον). The name, through Late (Vulgar) Roman, became Middle Latin Ulcinium, Slavic Ulcinj, Italian: Dulcigno (pronounced [dulˈtʃiɲɲo]) and Turkish: Ülgün. Çarshia (mn. Čaršija), is a neighborhood and town centre which connects the old and new parts (neighbourhoods). In 2009 it was reconstructed, with the asphalt being changed into sett and the water and electrical system were changed. The neighbourhood has some 200 shops. It has an oriental atmosphere. There are two mosques located in this area, the Namazgjahu Mosque and Kryepazari Mosque. Ulcinj is an ancient seaport. The wider area of Ulcinj has been inhabited since the Bronze Age, based on dating of Illyrian tombs (tumuli) found in the village of Zogaj, in the vicinity of Ulcinj. The town is believed to have been founded in the 5th century BC by colonists from Colchis, as mentioned in the 3rd century BC poem by Apollonius of Rhodes. Illyrians lived in the region at the time as there are traces of immense Cyclopean walls still visible in the old Citadel. 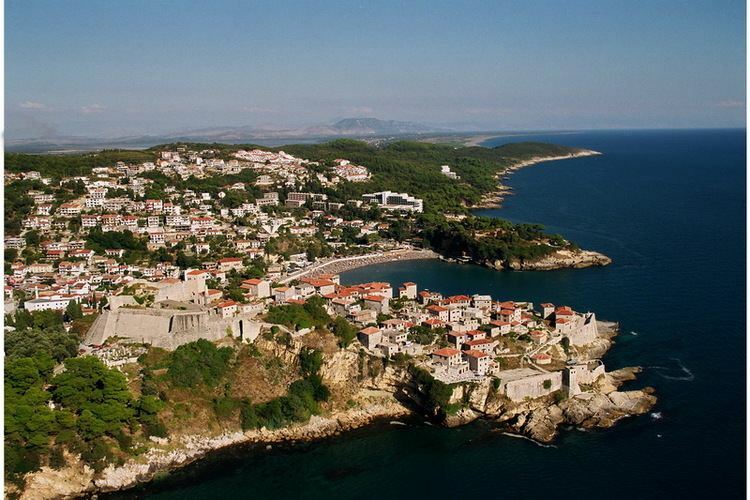 All the way in the pre-medieval period, Ulcinj was known as one of the pirate capitals of the Adriatic Sea. This is also seen during the later period of Illyrian Kingdom. Inhabitants of Ulcinj were known before time of Christ, especially from 20 BC to around 300 AD, to be very confrontational to those who were foreigners to their land; they were especially meticulous about border disputes as well. In 163 BC, the Romans captured Colchinium and renamed the town Olcinium. Under Roman rule the town received the status of oppidum civium Romanorum (settlement of Roman citizens), only to be later granted municipium (independent town) status. A section of their re-fortification can be distinguished from the Illyrio-Greek by the rustication of the walls. After the division of the Roman Empire, Ulcinj became a part of the Byzantine province of Prevalis and the population converted to Christianity. From Medieval times, and quiet likely earlier, it was regarded as an important trading and maritime center and still maintained the status of city autonomy. From circa 820, the city was the see of a Diocese of Ulcinj, which was only suppressed in 1532, and would be revived as a Latin titular bishopric. In the 9th century, it was in the Dyrrhachium theme, a military governorate of the Byzantine Empire. In 1010, Tsar Samuel of Bulgaria (r. 997-1014†) failed to conquer the town during the war against the Byzantines. By 1040, archon Stefan Vojislav of Duklja conquered the region. In 1183, Serbian Prince Stefan Nemanja conquered Olcinium and the town prospered as one of the most significant coastal towns. Ulcinj remained in Nemanjić hands in their Kingdom and Empire, and after the death of Emperor Dušan (r. 1331-1355†), the region, known as Lower Zeta, was under the supervision of gospodin Žarko, a voivode of Emperor Uroš the Weak until his death in 1360. Žarko's lands were then held by the Balšić family. Under Balšić control, Ulcinj continued to be an important town and also minted coins. The Balšić Tower in the upper part of the Old Town was built by the Balšić noble family in the late 14th century. In 1405 the Venetians conquered the town. Under Venetian control, the city was renamed Dulcigno in Italian, and it was incorporated in the Albania Veneta. The Venetians maintained control until 1571, when the Ottoman Turks conquered Dulcigno with the help of Barbary pirates, who didn't leave the town after conquering. It remained within the Ottoman domain for over 300 years, during which time its far-reaching reputation as a lair of pirates was established. In the 17th century a self-proclaimed Jewish Messiah named Sabbatai Zevi caused turmoil throughout the Turkish Empire with his evangelizing, which attracted thousands of followers. He was eventually captured and exiled to Ulcinj in 1666, where he died quietly ten years later. He was buried in the courtyard of a Muslim house which is still preserved as a mausoleum; along with two Jewish alters in the Balšic Tower. In 1867, Ulcinj became a kaza of the İşkodra sanjak of Rumeli veyalet. After the Congress of Berlin in 1878, borders between Montenegro and the Ottoman Empire were redrawn, with Ulcinj becoming part of Montenegro. Although prepared to cede Plav, Gusinje and the villages of Grudë, Hoti and Kastrati, Turkey still wanted to retain Ulcinj. Despite resistance against this decision, Montenegro, supported by British Prime Minister Gladstone and others from western Europe, resisted. Gladstone "threatened to occupy the customs house at Smyrna" On 30 November 1878 the town became part of Montenegro. During the 2006 referendum on Montenegro's independence, the Ulcinj municipality voted overwhelmingly to leave the State Union of Serbia and Montenegro. This was partly due to the region's large Albanian population. Ulcinj is the administrative centre of Ulcinj Municipality, which has a population of 19,921. The town of Ulcinj itself has a population of 10,707. Ulcinj Municipality is the centre of the Albanian community in Montenegro. It is the only municipality in Montenegro where Albanians form the majority with 60%. The majority ethnic group in Ulcinj are Albanians. The largest spoken language is Albanian. Ulcinj is a popular tourist destination in summer. In January 2010, the New York Times named ranked the south coast region of Montenegro, featuring Velika Plaza, Ada Bojana, and the Hotel Mediteran, as one of "The Top 31 Places to Go in 2010". Although still undiscovered by many travelers from larger countries, repeat tourists and an increasing amount of first time visitors make Ulcinj a hot spot for vacationers between the months of May and September. 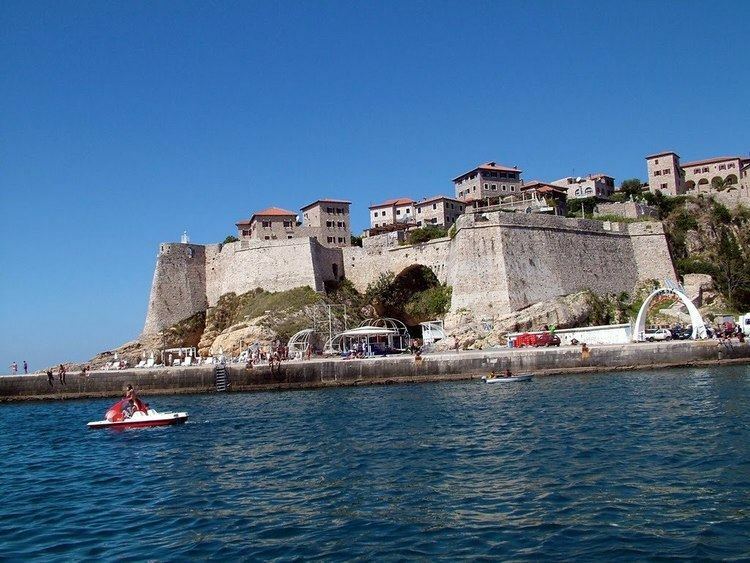 It is most famous for its sandy beaches, which are considered the most beautiful in Montenegro. The most valuable resource of the Ulcinj riviera is Velika plaža (Albanian: Plazha e Madhe, English: Long Beach), which is a 12 km (7.5 mi) long stretch of sandy beach and the longest beach on the Montenegrin coast. There is a small pebble beach called Ladies Beach which folk tradition holds to have qualities conducive to fertility. There is also a beach called Mala plaža (Albanian: Plazha e Vogël, English: Small Beach) which is much smaller in size, but is located in the centre of town and very popular with visitors. "The Korzo", as it is called by locals, is a promenade which separates a street lined with coffee shops from Mala plaža. At night during the summer months, the Korzo is pedestrianised and families and young people gather. There are many more less known smaller beaches that serve as get-aways from the main tourist areas. Ulcinj has also a large number of religious buildings like mosques, tyrbes and churches, including: Pasha's Mosque, Sailors' Mosque and St. Nicholas' Church. Ulcinj's old town is a well preserved castle-looking community that is left over from medieval times. The old town sits atop a mountain overlooking the shore and is a tourist attraction on its own. Ada Bojana (Albanian: Buna) is popular among foreign tourists from Western Europe for its peace and unique atmosphere. A large naturist campsite is located in Ada Bojana. Šaško lake and Ulcinj's salt pond are popular among birdwatchers, because Ulcinj and its surroundings are major resting points for over 200 bird species on their migration paths. There are numerous cafés, discos, and bars that dot the city that are usually filled to capacity throughout the summer. 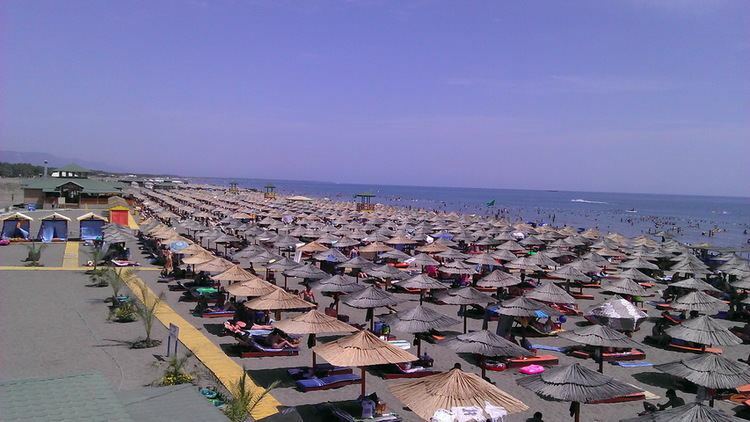 The majority of tourists that visit Ulcinj are Albanians (mostly from the United States), Serbians, Croatians, Bosnians, Slovenians, Macedonians, Russians, Ukrainians, and other Europeans. The Ulcinj "south coast" region is well known for its active sports, recreation possibilities and hunting . Kitesurfing at Ada Bojana, all manner of water sports at Velika plaža, scuba diving among wrecks and sunken cities, mountain biking, hiking, orienteering, cycling through the olive groves at Valdanos, long walks along the pristine beaches of the south coast of Montenegro, even deep sea fishing on the Adriatic, lake fishing at Lake Skadar, and river fishing in Ada Bojana, Due to the fact that the favorable habitat for wild life, has excellent conditions of hunting tourism.This place is the haven of omithological (gourmand) hunting in Reč and Shenkol most common wildlife are woodcock, Hare, Wild boar, and ducks. The beautiful attraction with flora and fauna in Ulcinj makes it an unforgettable journey in hunting activities..
Ulcinj has a borderline Mediterranean (Csa) and humid subtropical climate (Cfa) in the Köppen climate classification, since only one summer month has less than 30 millimetres (1.18 in) of rainfall, preventing it from being classified as solely Mediterranean or humid subtropical., The winters are cool and very rainy, and the summers are hot and humid with afternoon thunder showers. Unlike Podgorica temperatures very rarely exceed 35 °C (95 °F) and seldom drop below 0 °C (32 °F). Ulcinj is connected with the rest of Montenegro by two-lane highway. It is connected with other coastal towns by the Adriatic Motorway. Reaching inland is made possible by detouring from the Adriatic Motorway at Budva or Sutomore (through the Sozina tunnel). As of today, there are no airports in the city of Ulcinj. However, nearby airports in Tivat and Podgorica are both around 70 km (43 mi) away. There are regular flights to Belgrade and Zürich from Tivat. Podgorica Airport has regular flights to major European destinations throughout the year. Many tourists traveling to Ulcinj from abroad arrive to the city from the airport in Tivat due to its recent renovations and general ease of navigation. Đurađ II Balšić, Lord of Zeta from 1385 to 1403, member of the Balšić noble family.